We have seen elsewhere (MASONIC) that the foundations of modern freemasonry were laid in London in 1717, and the city continues to host a huge number of masonic lodges. In the metropolis Freemasons' Hall in Great Queen Street, has been the home for many lodges including, in the 1970s, Abbey Lodge, Westminster (2030), Lodge of Industry (186), Covent Garden Lodge (1614) and Lodge of Asaph (1319). However, some lodges still meet in hotels, continuing a tradition from previous centuries. Many of the early lodges were unable to afford, or were not sufficiently established to desire, their own premises but had a dedicated room in a local inn or hotel. Such an arrangement was beneficial both to the landlord, from the trade which it brought on lodge nights, and to the lodge whose furniture and paraphernalia were safely stored. 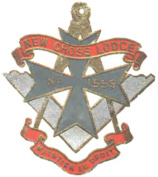 New Cross Lodge 1559. Founded in 1875 it met at the Charing Cross Hotel in the Strand. 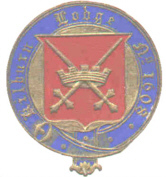 Kilburn Lodge 1608. Founded in 1876, it met at the Piccadilly Hotel, Piccadilly. 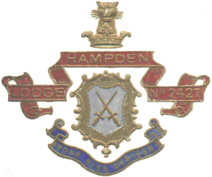 Hampden Lodge 2427. Founded in 1892 it met at the Great Eastern Hotel in Liverpool Street. 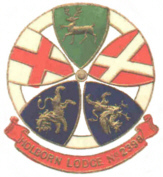 Holborn Lodge 2398. Founded in 1891 it too met at the Charing Cross Hotel in the Strand. Above is an attractive group of multi-coloured crests of four lodges which, in the 1970s, were still holding their lodges in hotels in central London. Whilst most lodges were instituted to serve the population of a particular area some had a form of specialisation. The Chancery Bar Lodge, meeting at Lincoln's Inn Hall, probably drew a large percentage of its members from the legal profession whilst the Scots Lodge, which was based at Freemasons' Hall, was presumably a haven for expatriate Scots. There was a long tradition of military lodges, providing for soldiers whose service required them often to be on the move. 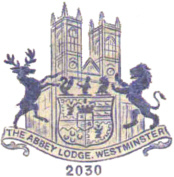 2599, the lodge of the Royal Engineers, was constituted in 1896, and Bloomsbury Rifles Lodge whose number, 2362, is not shown on its crest was founded in 1890. 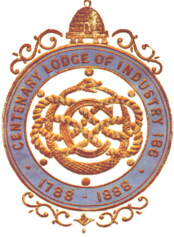 GENERAL; PROVINCIAL LODGES; FOREIGN LODGES; OTHER.